The forest kinders had a very full day today at the Stornetta Lands! We began by having circle in the cool morning shade under some pine trees. Because tomorrow is the International Day of Peace, we opened with a conversation about what peace means and why it is something we want to cultivate in our lives. I then passed out some gathering baskets and explained that we would be creating something special together using beautiful treasures we collected on the lands. 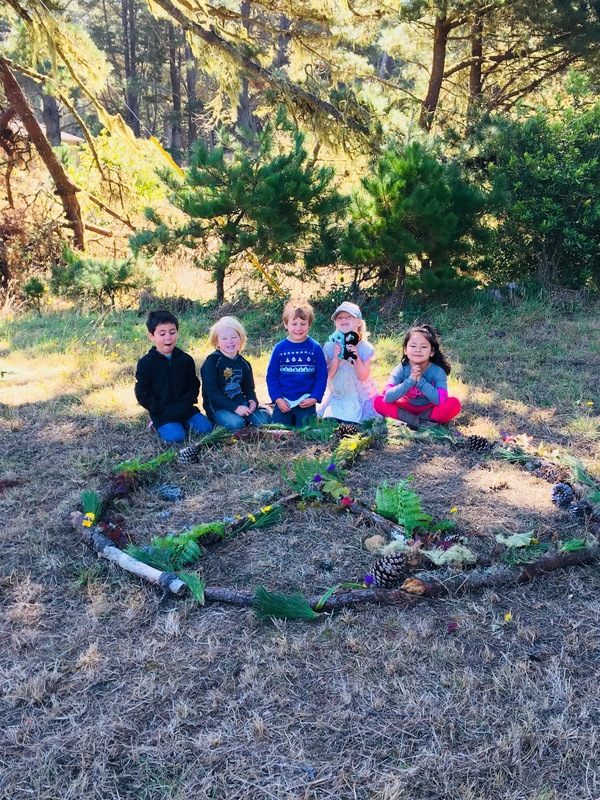 We then split into two groups and began gathering beautiful natural objects, such as pine cones, pine needles, dandelion and thistle flowers. When possible, we collected items that had already fallen to the ground. The kinders also did an amazing job of always saying "thank you" to the plants and trees that shared their beauty with us. C. was especially enthusiastic about collecting natural treasures, and was often quick to point out litter on the trail (which was also collected and taken back to a garbage can.) We walked slowly, using our "mouse eyes" to look for treasure, until it was time for snack. Coincidentally, it was time for snack just as we arrived at Huckleberry Heaven, so we got to have second snack on delicious berries! The kinders were very eager to return to their favorite Cyprus tree to play, and they were having such a great time that I felt reluctant to pull them away and continue on our mission. This made returning a little difficult as we were running low on time and there was still so much more to explore! Not to mention we still hadn't started on our special creation! By this time energy was getting low, and walking in the sun was hard work! When possible, I guided us in songs or games to make the walk more fun (if you know of any fun sing-along songs, please let me know in the comments!) We finally made it back to the parking lot, exhausted but hanging in there, where I was able to finally let the kiddo's in on the surprise.... We were going to use our collection of natural treasures to make a beautiful peace sign mandala to leave on the ground for all the visitors to enjoy! Somehow all the kinders were able to rally up the energy and participate in putting this beautiful creation together. Let us know if it's still there next time you visit Stornetta!